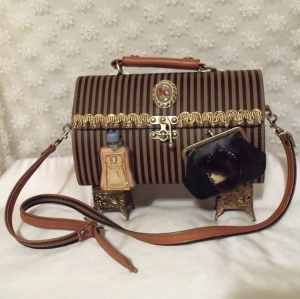 This purse was named after Lady Violette. She is one of those people you just know you were meant to cross paths with. We have become dear friends and have way too much in common to just be coincidence. She is in the process of doing an article on my purses and I am in the process of doing an article on her titled…..All Things In Time. Her site is ideal for the vintage fashion gals and the lovers of the arts. I highly recommend checking her blog out. What Happened to Marelle Couture……..
We all have our favorites … Mes favoris absolus. Crowns, Jewels, Gems, Haberdashery, Jewelry & Purses for Days…..How to Choose?